Back in 2011, my cousin Robert Ainsworth, a playwright, asked for my opinion on a script he had been working on. 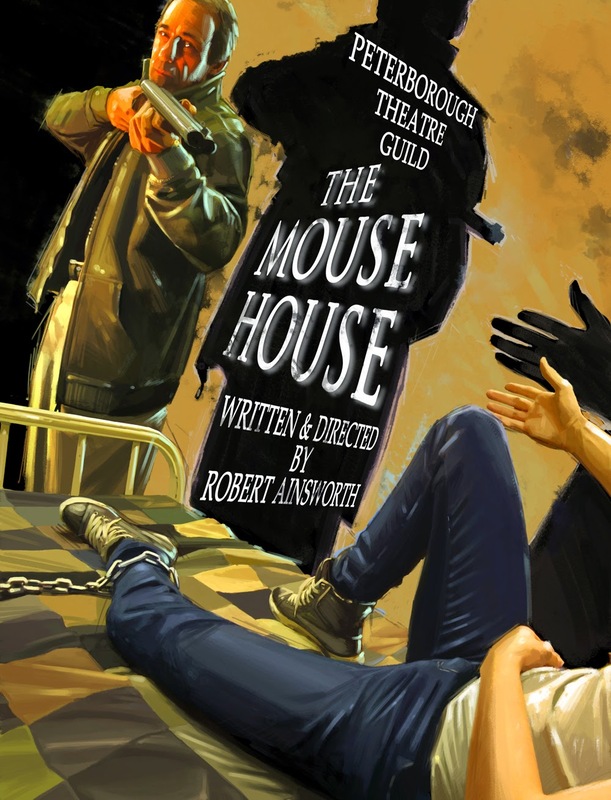 Called The Mouse House, a play about Troy, a young streetwise addict with very sinister intentions breaking into the isolated winter cabin of a wealthy author. His plan fails- as Carson, the author, is smarter and stronger than the lad anticipated- Troy finds himself held captive and chained to an old heavy metal bed frame. Carson may have some very sinister intentions of his own. This intense story has shocking revelations that turn it on its head before reaching an exciting conclusion. Before I reached the second act, I knew I had to be involved on Robert’s journey. I offered to create the poster for the play if it ever went into production. A year later, The Mouse House was performed for the first time to sold out performances, and went on to win several theatre awards including best acting, direction, and best production. It continues to be performed by theatre groups across Canada. You can buy a copy of the script here- it’s a page turner!